I can’t slow my heart rate down with any reliability lately. It’s been in the 100’s for the past week straight. That hasn’t happened since the move (or, I haven’t noticed/kept track). It’s nowhere near the 140’s it used to be, but it’s also an increase from the 90’s it had been of late… I can feel it working. I wouldn’t call it pounding so much as quite noticeable. At least the “flopping fish” feeling isn’t back, and the tightness from last month is gone. I should just go take my sleep aid, but that’ll require a bit more conversation with myself. When I told Dr C that I knew it was only L and the cats in the bedroom, and that the dogs were lose in the apartment overnight, yet I still couldn’t bring myself to walk in there easily, she changed the perspective. She pointed out that L and all the animals are in the house with me. No one can come in or do anything without being noticed. Maybe getting to look at it that way will help. I still have to take the dogs out one last time before bed. As cute as he is, I’m hoping the little skunk isn’t back tonight. It makes taking them out a longer process (they are easier to handle one on one when there’s prey around, and the skunk is only prey if the little guy gets riled-up. The girls don’t much care about wildlife when they are on their own). The “hands” won’t leave me alone… they get quieter if I can be distracted enough, but then they return. I was trying to see if my insurance would cover a weighted blanket (something I’ve found to be helpful in feeling safe enough to sleep), but they were dodgy about it. I have to get the appropriate treatment code to bill under or its not even considered. They won’t tell me the treatment code though. I wonder if I asked Dr C about it, would she know? She has a fair amount of experience working with autistic clients and definitely trauma clients. Maybe she’s come across the code before? I wonder if her recommendation would be enough, or if it’d need it to come from an OT or a medical doctor. We’re still working on the “hall pass” idea, though I’m no closer at having something to try than I was last night. Maybe she’ll think of something to suggest? I feel weird going back every day this week. Originally it was to try to get some emdr in, but since that’s not been something I think I am ready for at this moment, we’ve just been talking… Maybe tomorrow we’ll get to the art… I’m not in crisis, but the pressure to keep talking about the memories is strong. I’ve opened them up recently, and now they are spilling out. I’m relieved I can spill them to Dr C rather than try to contain them till next week. I hope she doesn’t get too sick of me. -it’s ok to have needs. -even if that need is simply to check that she is still there (it doesn’t bother her or significantly impact her time away from the office). -keep trying coping skills, but she is also ok with reaching out. She will respond as she is able. If texting doesn’t work, it’s ok to call her too (or ask her to call). -it’s ok to change the topic of conversation with a friend if it’s triggering. -try to notice the dissociation before it’s happening or as it’s happening so the trigger can be dealt with and I don’t have to keep exposing myself to it. -Dr C will not drop me or refer me out if I’m struggling (same as last time), so it’s ok to say if I am (preferably before a crisis point, and most certainly before I need to show up at my doctor’s office or the ER bleeding out). -I’m still miles above where I was the last time I was hospitalized, and many more miles above where I was in 2010. -it’s going to be tough, but it will be ok.
With the end looming for my therapy, I find myself wanting to spill all sorts of info to TM. I’m not sure why. I suddenly have questions and thoughts and I want to ask her a whole bunch of stuff about my abuse and ptsd and self-harm… why can I only muster this resolve when I’m moving on to someone else? It’s like it only feels safe enough to bring all this up when the threat of having to see the person again is over. I am suddenly realizing I trusted her enough to express this stuff, but I kept freezing and getting scared before. I always worried she would hate me or use what I told her against me in some way. I didn’t think she would actually do those things, but I feared she might… Now I want to get as much support from her as possible, only it’s too late because there isn’t enough time. These are the ultimate doorknob disclosures. They are all the big things I was scared to address, but now I desperately want to find support around… :sigh: Will I ever learn to do this while there’s still time to talk? Wow, this turned long. and tangential. Sorry. They say insight helps move you forward. But what if you have all this insight, and don’t know what to do with it? It doesn’t magically change things. It still takes a lot of work, and struggle, and… I’m tired of having insight and not knowing what to do with it. I hate that trust comes so hard. I hate that I need to find a paid someone to trust and reach out to. I hate that it always ends so soon. I’ve seen more therapists than I have been in years of therapy. There have only been 3 I was able to see for more than 10 months (and 3 out of the last 4 I only saw for about 4 months each)… JF was an intern when I started seeing her, but she got hired on to keep working at the clinic, so I saw her for 2.5 years (until I graduated). LKB was the first private-practice therapist I saw. She ditched me after 2 years because I was too acute… then Dr C I saw for 2.5 years until I moved. Everyone else was an intern, except De & TM, who were/are limited by agency policy. There was JJ, DJ (saw her one year during two of the school breaks, so maybe 10 times total), B, CS, JF, TB, JG, LKB, SC (dbt), Dr C, BGR (iop), L (dbt), Dr GD (the center), D, JP, De, TL, and TM… I’m missing a few because last count TM was #18 or 19… who am I missing? I hadn’t included therapists I saw fewer than 5 times, or any psychiatrists, or clinicians associated with hospital programs who I would have only seen a very few times. Anyway, I digress again. Trying to avoid being the drama queen De saw me as. Trying to pull out of the crisis cycle that is threatening to come barreling in full force. Trying to put all this insight to use. Let’s hope it all works. I had started consciously distancing myself from my self-destructive thoughts maybe 2 or 3 weeks ago? It was very much on purpose, in an effort to respond to stress differently and not land myself in the hospital. This started as a good thing. It was helpful. I kept reminding myself that I needed to change my reactions to change the outcome. Great. Makes sense. Only somewhere along the way, I lost control of it all. I’m not sure I’m explaining this well. It’s difficult enough to grasp, let alone explain. I know I also met up with a friend for lunch afterwards. I know we met because I have a receipt from the restaurant. I have a vague sense of having spoken to him today, but again, it’s from a great distance and with no emotional connection. I try to ground myself. I try to be mindful of the moment, and draw in the experience – will myself to remember it. It all feels so very far away though. I try to write about it, but pretty much the instant the moment is over, I’ve lost touch with it. If I’m not writing in the moment, it’s mostly gone in an hour or less. I had written something to TM after last week’s session. At the time I wrote it, I instructed myself to print it out and give it to her this week. I wrote that I knew I would lose the connection to it and no longer understand why it was I wanted to give it to her. I titled it “Print this out and give to TM on Tuesday”… and yet I failed to give it to her. Once in the office, I worried that I would not know how to answer any questions she may have about what I had written. I didn’t relate to any of it anymore, so I wouldn’t be able to explain it… It’s still in my bag. I never gave it to her; never even hinted at having written anything. I wrote a bit again today, and did similar instructions to myself. Maybe I will manage to give it to her next week. I think I left her a message today asking to find a way to effectively ground from this. It too feels like a dream, but there is a call to her number later in the day, so I must have followed through on it. This was a decent defense-mechanism in theory, but it has gotten way out of hand. I need help reigning it back in. I have started and stopped to reach out for more help around it a bunch of times lately, but I always forget why it was I tried to call someone or write a post. It doesn’t make sense to me, or I forget what I was going to ask, so I hang up, or delete the post. I feel like my trains of thought de-rail quickly and easily. I get distracted at the slightest thing. Sometimes I can recognize it as that push to keep stress at bay, but other times I don’t notice the effort. I need to be able to make it a conscious and deliberate thing again. If I were to be seeing her later today, the walls would fly back into place. I would deem all this “stupid” and not be able to speak about it. But I’m not in danger of seeing her for another 6 days, so it’s ok to feel this need to spill to her. It’s ok to want to talk about details and impact and insights. It’s safe right now. Only this pattern makes for difficult therapy. I throw other things at her. I create distractions and talk around things. I disappoint myself in my inability to move forward in therapy… I only want to be vulnerable because I can’t really be vulnerable right now. Even if I were to call her, I wouldn’t be able to voice any of this. 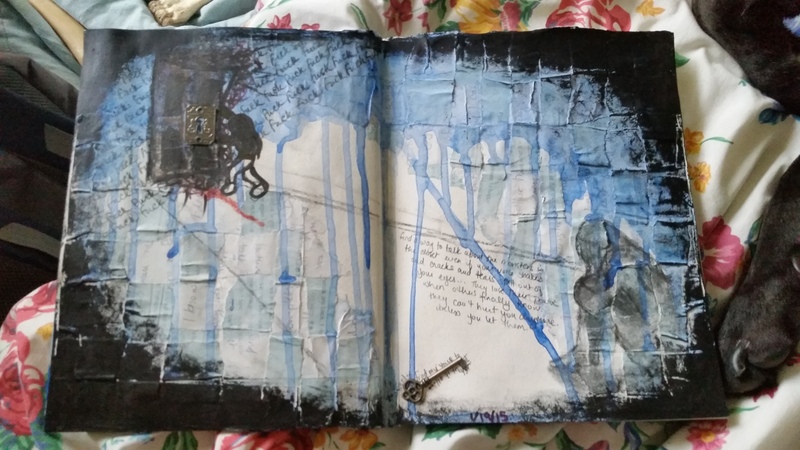 This journal page started out with an idea around trying to “find your voice”, but took a bunch of turns. Was kinda trying to both prompt myself to talk openly to TM about the monsters, but also convey the fear and desperation around trying to cram the monsters back into the closet as soon as they appear. There’s the shutting-down when faced with talking about them, the frantic push to keep the monsters out in the first place, and the knowledge that they lose their power when finally talked about. The key to talking about them feels just out of reach, but they threaten to burst through the door anyway (the locks are failing and the door will soon give way)… trying to keep it far away and disconnected, but build on what is already spoken about. All shrouded in darkness except when the flashlight gets turned on in therapy. Cheesy! But whatever. Maybe I can lead with this tomorrow, because it kinda covers everything from the fear of talking about it to the fear of not taking about it, and the need for safety around it… also much more condensed than the 30+ pages worth of journaling I’ve done this week… hmm.